The Country Inn & Suites San Antonio Medical Center Hotel is centrally located in San Antonio adjacent to the South Texas Medical Center and University of Texas Health Science Center. Our hotel offers a new, state-of-the-art lobby, providing free Wi-Fi throughout. While staying at our hotel in San Antonio, relax at our new outdoor experience, take a dip in the outdoor pool, work out at our fitness center or visit The Market, open 24/7. 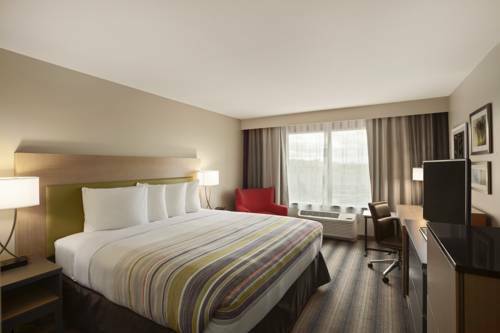 Guests also enjoy updated guest rooms featuring well-lit work desks, HDTVs, microwaves and mini-fridges. For small events, a newly-renovated meeting rooms totaling 225 square feet. Our Meeting Room suited for up to 25 attendees. AV equipment is available to be rented for your meeting. A full business center that allows you to copy, fax & print. We also provide access to overnight delivery and pickup services. A 250-acre marine mammal park, oceanarium, and animal theme park, located in the Westover Hills District of San Antonio, Texas. There is also a water park named Aquatica that opened in 1993. 200 acre theme park in San Antonio, TX. There are 6 themed areas of the park:Los Festivales, Crackaxle Canyon, Spassburg, Rockville, Fiesta Bay Boardwalk, and Kidzopolis. Historic area of San Antonio that was the place of a major battle in 1836. 3,500 animals representing 750 species over the span of 35 acres. It also has non-animal attractions that include a 2ft narrow gauge San Antonio Zoo Eagle train ride. A network of walkways along the banks of the San Antonio River, one story beneath the streets of Downtown San Antonio. It is lined with bars, shops, and restaurants. Renovated AMC multiplex in Rivercenter Mall with reclining seats plys a cafe & bar. A historic Catholic mission in San Antonio. Many of the buildings in Texas Tech in Lubbock, TX borrow architectural elements from the Mission San Jose which is now a part of San Antonio Missions National Historical Park. It was known also as Chinese Tea Gardens, Chinese Tea Garden Gate, Chinese Sunken Garden Gate and is listed on the US National REgister of Historic Places. Located on the Northern section of the San Antonio Riverwalk.